The peaceful courtyard of Hotel Born in Palma. 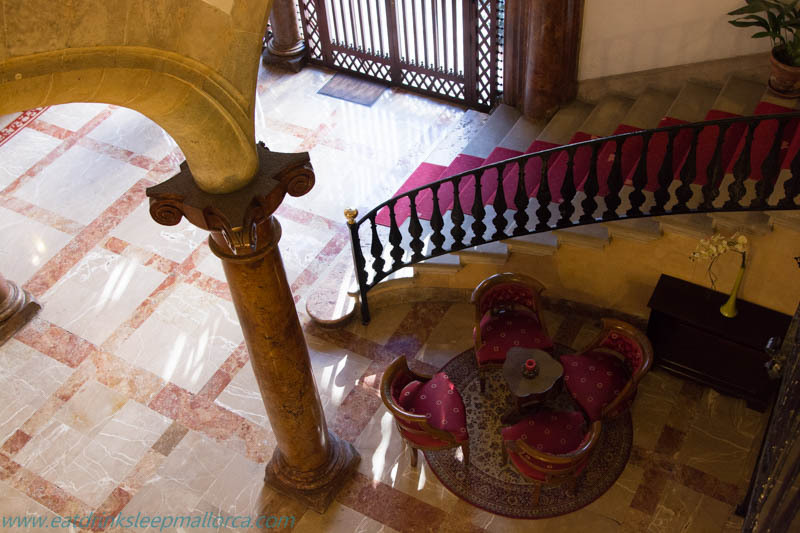 Despite having suggested Palma’s Hotel Born a few years ago to a friend, as a reasonably priced place to stay in Palma, we’d never spent a night there. Fortunately, said friend really liked it. The hotel has been on the must-try list for some time, along with plenty of other hotels on Mallorca I’d like to write about here. The recent Peccata Minuta event in Palma proved the perfect opportunity to put Hotel Born to the test. The tapas event didn’t start until 9pm and there would be wine. Which meant there should be no drinking for whichever one of us was going to drive. Although there’s a reliable, reasonably priced railway service linking Palma with our nearest town, the last train from the capital leaves at 10.15pm. So much for late nights out in Spain! It made sense to find somewhere to lay our heads for the night so that we could enjoy the whole Peccata Minuta experience. If you missed it yourself, the organisers Chefs(in) made the following video of the event (in which we make a fleeting appearance). Eagle-eyed watchers of The Night Manager on BBC TV may recognise Palau March, the venue, as the exterior of the Istanbul hotel seen in episode four. Anyway, we booked ourselves a room at Hotel Born for a little over 120 euros for the night, including tax and breakfast. A good price for a stay in the centre of Palma. Hotel Born is ideal for those who want a more traditional place to stay in Palma; it’s conveniently located for anyone wanting to be right in the heart of the Mallorcan capital’s shopping centre. It’s a few steps away from the Paseo del Borne and the colonnaded shopping street, Jaime III, but has only a narrow – mainly motor-traffic-free – lane outside its front doors. The hotel was originally built in the 16th century as a palace for the Marquis of Ferrandell. 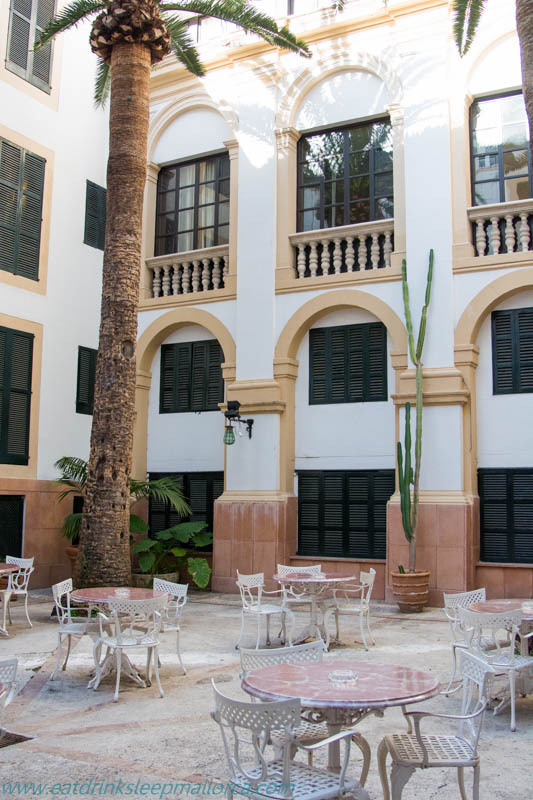 It still has features such as the large wrought-iron gates and patio, or courtyard, that are typical of the traditional Mallorcan noble properties that can be seen in Palma’s old town. Part of Hotel Born’s spacious tiled foyer. Another area of the foyer of Hotel Born. The family-owned Hotel Born was completed renovated in 1993, prior to which it had been a hostel. As we were checking out and paying the bill, the receptionist told us that it had originally had 90 simply furnished bedrooms, with one bathroom to every 10 bedrooms. Today it has 30 much more spacious rooms, thankfully all with en suite bathroom. 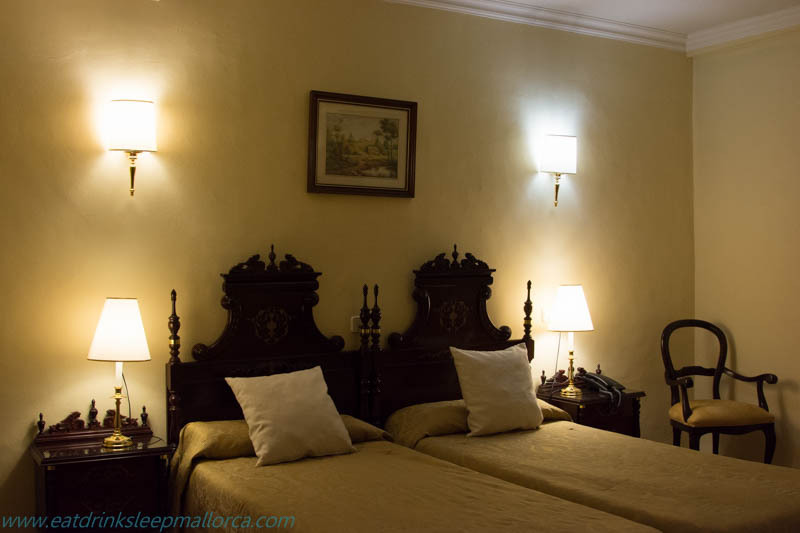 The style is traditional Mallorcan, with antique-style furnishings. Our room (303) was spotlessly clean, comfortable and neat and, although the bathroom was a bit small and old-fashioned in style, it too was clean and perfectly adequate. The room and bathroom were both comfortably warm (there’s also air conditioning for the summer months). Our room overlooked the courtyard and was very quiet. I’d recommend asking for an inner-facing room if you book to stay here. The free high-speed Wi-Fi worked very well in our room. The hotel does not have a lift (elevator), so ask for a room on a lower floor if a lot of stairs are a problem. Neither does it have a restaurant, but Palma is full of great places to eat (several in the same little lane as the hotel). If you’d rather eat in, sushi from the nearby Japonice restaurant can be delivered to your room. 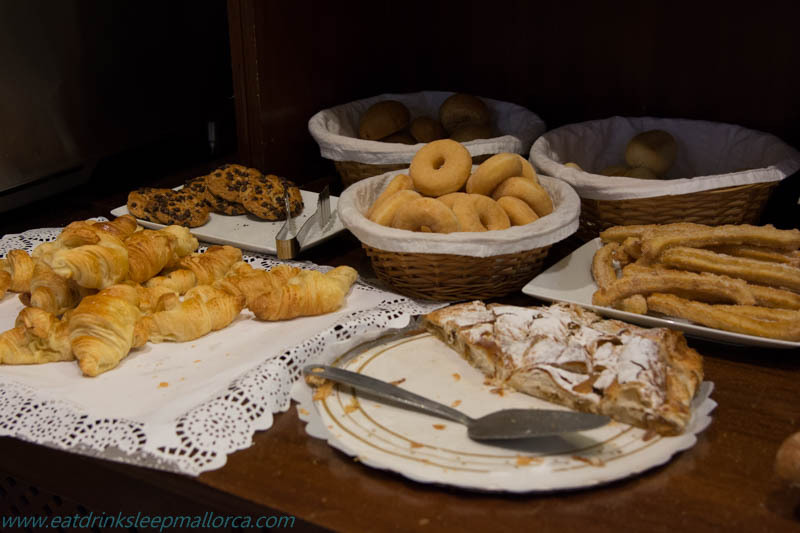 The breakfast buffet offers a decent enough choice (including Mallorcan offerings) and our coffee was made to order. 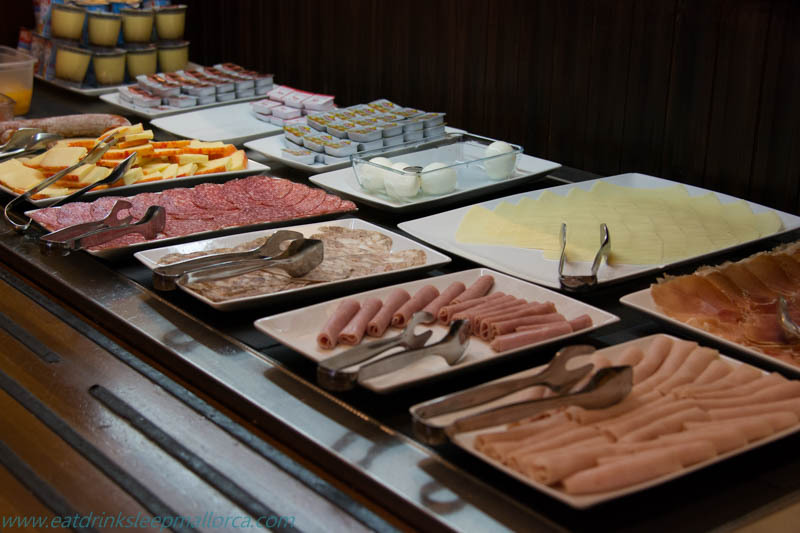 Supplies at the buffet were regularly replenished. In warmer weather you can enjoy breakfast at a table in the courtyard but, in winter, this isn’t an option. My only tiny gripe was that, even at the end of February, the breakfast room is too small for the number of guests. When we arrived for our breakfast, the room was full and another person was already waiting for a table. Shortly after we were seated (at a table for four), we were joined by a German couple. I always enjoy meeting new people but am not at my most sociable over breakfast! When we were checking out, the receptionist told us that quite a few people from the north of Mallorca stay here after a day’s shopping or a night on the town. 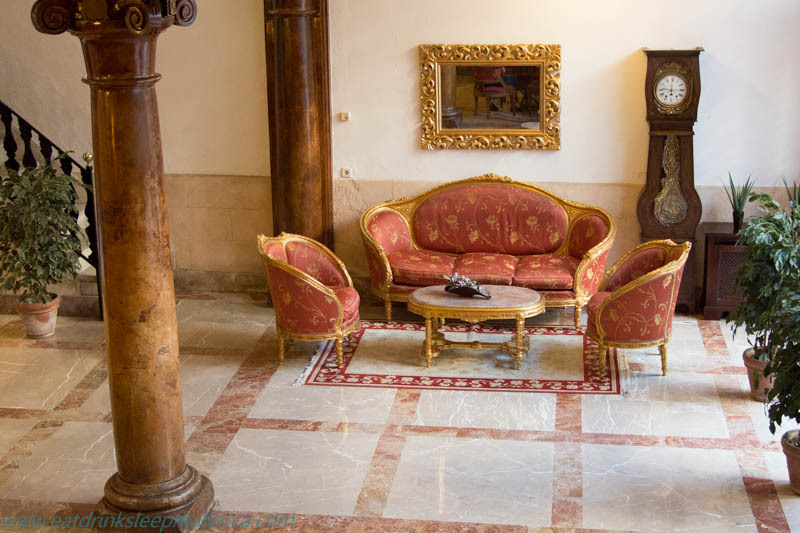 Hotel Born is certainly a great affordable option if you want to be in the centre of Palma, and don’t mind sacrificing the fluffy robes, slippers, minibars with designer crisps and chocolates, and other little extras provided in more expensive hotels. A bonus: we were pleased to be given a small discount because we paid our hotel bill in cash, rather than by card.